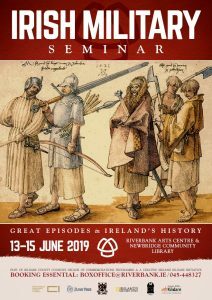 As part of Kildare’s Decade of Commemorations, the third Irish Military Seminar will be held 13-15 June 2019 in the Riverbank Arts Centre & Newbridge Community Library. Second Session Saturday, 15 June, 10.20-11.05 a.m.
Dr. Leeann Lane is a lecturer in the School of History and Geography. She is the author of Rosamond Jacob: Third Person Singular published in 2010 by UCD Press. Her study of Dorothy Macardle will be published by UCD Press in May 2019. In 2012 she was appointed by the Taoiseach to the Expert Advisory Group on the Decade of Commemorations. Fifth Session Saturday, 15 June, 14.30 – 15.15 p.m. This presentation will look at how the influences, feminism, nationalism, trade unionism, which made and shaped female republicans in the revolutionary period in Ireland, using 1916 rebel, feminist and trade union activist, Margaret Skinnider, as a case study. Mary McAuliffe is an Assistant Professor in Gender Studies at UCD. She holds a PhD from the School of History and Humanities, Trinity College Dublin and lectures on the UCD Gender Studies programmes at University College Dublin. Her latest publications were We were there; 77 women of the Easter Rising (co-written with Liz Gillis) and Kerry 1916; Histories and Legacies of the Easter Rising on which she was co-editor. She was the historical consultant on two major 2016 commemorative projects; Richmond Barracks and the Royal College of Surgeons. She is past President of the Women’s History Association of Ireland (2011-2014) and on the advisory board of the Irish Association of Professional Historians. Her latest research includes a forthcoming biography of revolutionary and feminist, Margaret Skinnider (UCD Press, 2019), and a major research project on gendered and sexual violence during the Irish revolutionary period, 1919-1923.